data for politics #14: Who is Trump's Base? Who is Trump’s base? At first glance, it may seem like an easy question to answer, but in reality the question is quite fraught and presents different paths forward for the Democratic Party. White evangelicals: White evangelicals have been the base of the Republican Party for years and Trump made aggressive overtures to them, embracing anti-choice rhetoric, selecting Mike Pence as his Vice President, promising to appoint culturally conservative Supreme Court justices, and offering specific policy reforms such as repealing the Johnson Amendment. Here, I operationalize white evangelical as individuals who say they are “born again,” on the 2016 Cooperative Congressional Election Studies survey (all analysis will make use of this survey). White men: Trump’s general election opponent, Hillary Clinton, was the first woman nominated for president by a major party. In addition, Trump has a long history of sexual assault and harassment as well as derogatory comments about women. During his time as president, the gender gap in partisan support has reached nearly historic levels. White non-college: Journalistic accounts of Trump’s based have frequently placed their focus on non-college whites, or working class whites. These accounts often pay special attention to non-college whites who voted for Obama in 2012 but Trump in 2016. White over 50: Recently, commentators have paid more attention to older whites’ role in electing Trump. For instance, Michael Grunwald recently wrote about a retirement home in Florida, arguing that the future of the Republican Party may well be these retirees. White over $50,000: Analysts have frequently noted that the median Trump voter wasn’t poor. Many low-income whites didn’t vote; wealthier whites who would benefit from Trump’s tax cuts were more likely to turn out. Here, I analyze whites earning more than $50,000, a reasonable cut-off for non-poor in most states. White rural: Many commentators have noted that the “Trump era” in politics has coincided with geographically polarized voting. Here, I operationalize white rural based on a ZIP code measure that Data for Progress uses for multilevel regression and poststratification. Which Group Supports Trump The Most? To begin, I analyzed vote choice for each “potential base,” analyzing only validated voters (those that the CCES matched to the voter file as having voted in 2016). As a baseline, 40 percent of whites voted for Clinton, 54 percent for Trump and the rest for someone else. In this analysis, white evangelicals immediately stand out. Nearly four in five white evangelical voters voted for Trump, with net support of +61. No other group comes close to that level of net support, with white rural voters having net support of +32. Thirty-four percent of non-college white voters voted for Clinton and 60 percent voted for Trump. Among over 50s, 37 percent voted for Clinton and 60 percent for Trump. Among white male voters, 37 percent voted for Clinton and 56 percent voted for Trump. Which Group Makes Up The Biggest Share of Trump Voters? Next, I compared the estimated share of the voting eligible electorate for each group with the share of Trump voters. That is, if a group is 20 percent of the eligible electorate and 25 percent of Trump’s voters, the difference would be +5 (or .05 in the chart below). In absolute terms, evangelicals and non-college voters stand out, but the largest gap is among whites over 50, who make up only 46 percent of the voting eligible electorate but 60 percent of Trump voters. This effect is largely due to their high levels of turnout. When analyzing all voters, non-college whites and white evangelicals still stand out, but the gap among whites over 50 whites shrinks dramatically. Which Factor Most Predicts Trump Support? To further test this, I ran a series of logistic regressions and calculated the average marginal effect for each demographic characteristic. First, I ran a multinomial logistic regression including three outcomes: Clinton, Trump and another candidate. I then calculated the conditional marginal effect of each variable, which were all coded as binaries for simplicity (i.e. 0 or 1) holding all other variables equal. 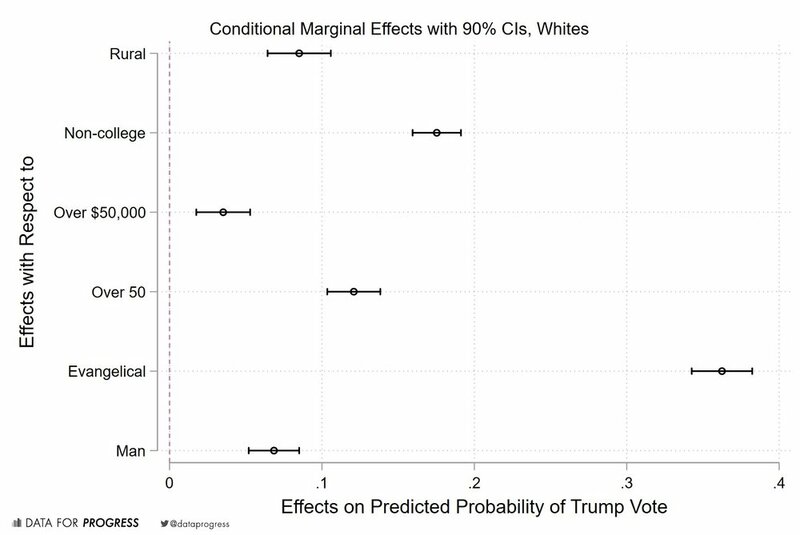 The chart shows the dramatic result: holding other factors equal, being an evangelical increases the chance a white person will vote for Trump by nearly 40 percentage points. The next closest variable, being non-college, has an effect of nearly 20 percentage points. When I exclude third party voters, we see a similar result. Another way of thinking about Trump’s base may be to analyze which voters separate him from a standard Republican. That is, which voters comprise a uniquely “Trump” base, as opposed to the “Republican” base. To identify “Trump’s” base, I ran the same model, but only among whites who did not identify as Republican. (Another regression, analyzing whites who recalled voting for Obama, generates a similar plot). Perhaps surprisingly, not only did Trump perform well among evangelicals generally, he appears to have moved some white evangelicals out of the Democratic or Independent column (this fits with exit polls and my analysis of Voter Study Group data). While other groups have moved away from Trump, white evangelicals have moved towards him. White evangelicals account for, depending on the dataset, between 1 in 4 and 1 in 5 voters -- roughly equivalent to the share of the electorate accounted for by people of color. While white evangelicals clock in at net support of +61 for Trump, people of color were +52 pro-Clinton. While non-college whites do indeed make up a significant portion of Trump’s base, they also make up a non-trivial share of Clinton voters. If we define the base as a group making up a non-trivial share of the electorate that overwhelmingly prefers one party, it is fair to call white evangelicals Trump’s base. If we define the base purely by the size of the coalition, we might prefer instead white non-college voters or whites over 50, both of whom make up more than half of Trump’s voters. If we want to analyze specifically “Trump’s” base, or voters that gravitated toward Trump but might not have for a normal Republican candidate, traditional narratives about non-college whites are correct. However, perhaps surprisingly, Trump also converted some white evangelicals who had voted for Obama. The characteristic most likely to be shared by a white person who voted for Trump is non-college status, but this is true of all white voters (the non-college share of the electorate is significantly larger than college). If you want to know one thing that will tell you whether a white person voted for Trump, ask them if they are born again. Sean McElwee (@SeanMcElwee) is a co-founder of Data for Progress (@DataProgress). Note: Thanks to Michael Podhorzer of AFL-CIO for inspiring this post and Jon Green for making sure I’m not an idiot (as usual). Data and code for regression analysis available here.